We believe it’s impossible to separate what we create from how and where we create it. That’s why BaoCare is as much about the natural skin care solutions we’ve created for you as the people who help to produce our range and the environment from which we source our raw materials. 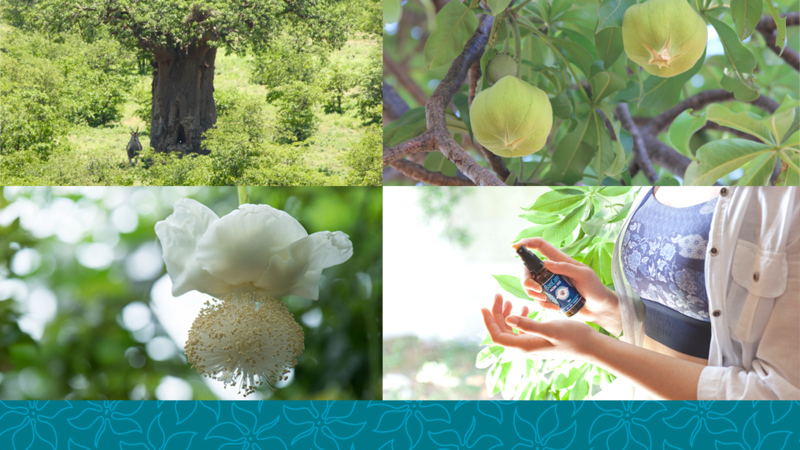 Below, you’ll learn about the unique properties of Baobab oil and how we’ve carefully blended complementary natural ingredients in our skin care solutions to yield the best results for each skin condition. You’ll also read about the Culture of Caring, one of the key premises upon which BaoCare has been built, based on the inherent wisdom of the Baobab tree itself. Baobab fruit pods are wild-harvested by collecting only the fallen fruit. This ensures that the fruit is properly ripe and that the trees are not damaged in any way. They are then taken to the EcoProducts factory where they are broken open and the small dark brown seeds are separated from the highly nutritious baobab powder. Once the seeds are cleaned, they are cold-pressed to release the rich golden-amber coloured oil. 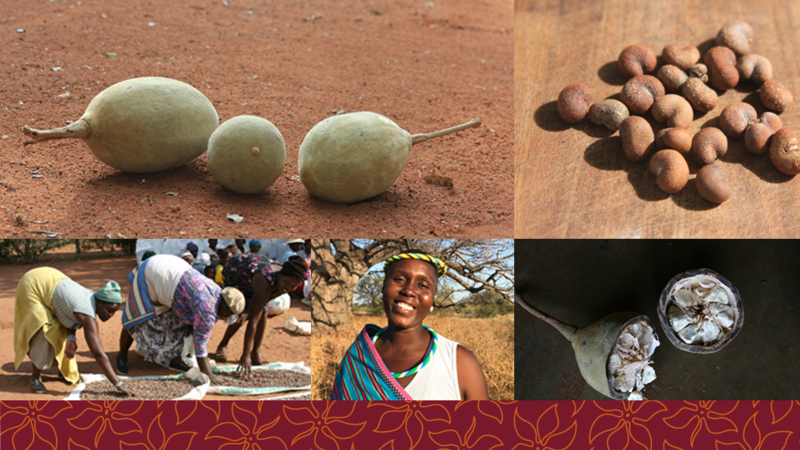 The seeds only yield 5 % oil, making Baobab oil a rare and precious harvest. Baobab oil is a naturally light oil which doesn’t clog pores and absorbs rapidly without leaving a greasy residue. It has a unique fatty acid profile with exceptional quantities of Omega 6 and 9. These essential fatty acids are known to maintain elasticity, soften and smooth the skin, helping to retain moisture, soothe inflammatory conditions and regenerate new skin cells. Baobab oil has been clinically proven to deeply moisturise and hydrate the skin as well as reduce trans-epidermal water loss. We created BaoCare, a range of synergistic combinations that optimise baobab oil’s innate skin healing properties taking it to another level of skincare. While our 100% organic pure baobab oil has enough impressive and unique qualities to stand on its own, it also blends beautifully with other skin-enhancing ingredients, which have been carefully selected for our BaoCare range. The healing synergy created by combining these ingredients with carefully selected essential oils results in healing skin solutions which work on multiple levels. All BaoCare products are free from synthetic chemical ingredients, parabens and mineral oils. Each skincare solution has been meticulously formulated with ingredients best known to be helpful for each specific skin condition. We’ve selected Calendula and Schizandra for soothing and calming stressed, hyper-reactive skin associated with eczema. Jojoba and Pomegranate extract for soft, dewy beautiful 40+ skin. Tea Tree and Evening Primrose oils were chosen for their Omega 6 and anti-microbial properties found to be helpful balancing oily skin. Our tissue oil has been specially formulated with natural vitamin E oil and beautifully fragranced for everyday use. We developed a soft delicate fragrance with 100% pure essential oils mixed in careful ratios. Baobab oil resonates particularly well with Lavender which gives an overall herbaceous floral fragrance, with Rosemary adding a minty slightly woody freshness. Myrrh is considered to be warming, rich and resinous with Benzoin lending sweetness. These essential oils are known to have anti-inflammatory and anti-septic properties on a physical level. From an aromatherapy perspective, they are also well known for having a soothing, calming effect on the nervous system on a mental and emotional level. Rose Geranium, Rosewood and Clary Sage are additional ingredients in some of our formulations, contributing to general skin enhancement and skin health. Through the combination of pure, quality ingredients and expert formulations, we’ve created a skincare range which harnesses the healing properties of nature. 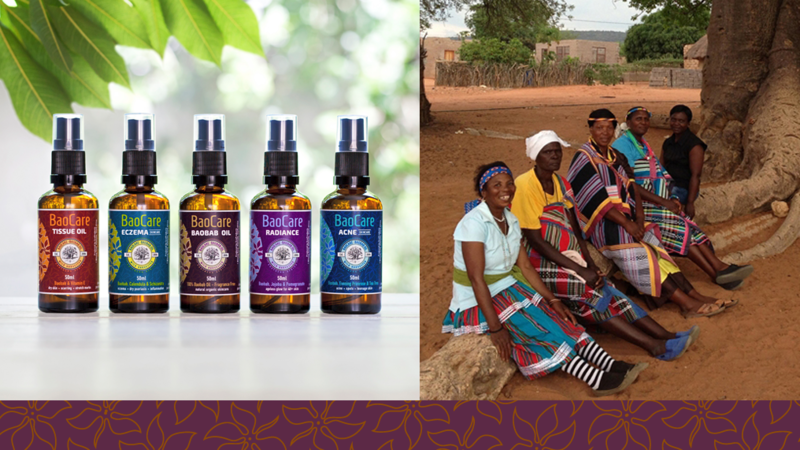 Our certified organic baobab oil is wild-harvested in the Limpopo, the heart of baobab country by EcoProducts, South Africa’s first and only baobab producer. Only the fallen fruit is harvested ensuring that no trees are harmed in the harvesting process. EcoProducts employs mostly women from Venda communities in the area who are often the sole breadwinners of their families. EcoProducts also runs the Baobab Foundation, which sources funding to support pre-school creches. Research has established Early Childhood Development has been identified as a means of breaking the poverty cycle. Children who do not receive a strong foundation in their early development are found to be stunted academically. By focusing on the correct development areas and adequate nutrition before school-going age, children are given a boost that will help them for the rest of their lives. 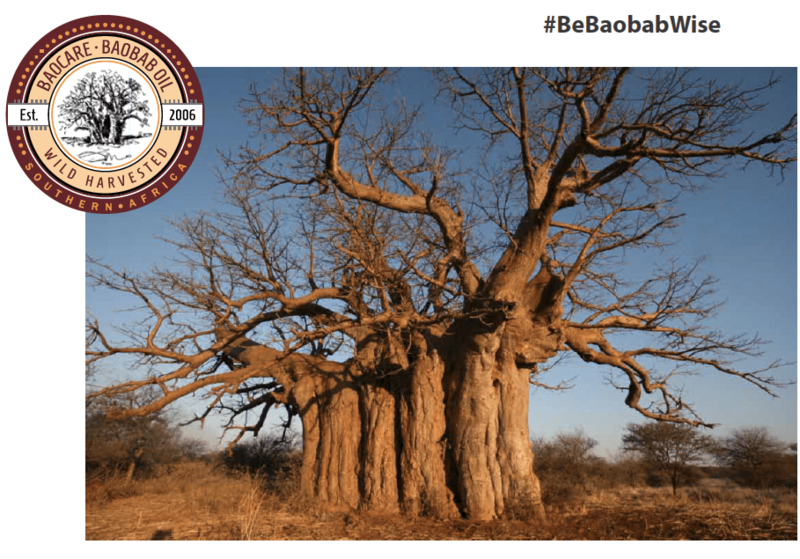 EcoProducts has also created the Baobab Guardians Program, a baobab tree planting initiative designed to counter the damage that livestock causes to young baobab seedlings, so preventing new baobabs from growing. There’s a beautiful natural resonance in a tree celebrated for its longevity, providing oil which keeps our skin supple, healthy and ageless. And just as the baobab is able to thrive in hostile desert conditions, so baobab oil helps us to weather harsh environmental elements which dry out and damage our skin. BaoCare taps into the profound wisdom of sourcing our healing solutions from the same environment in which we live: Africa.